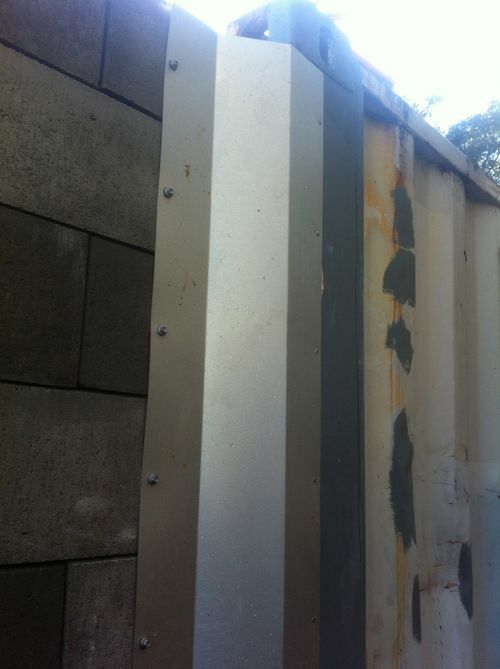 So this morning, while waiting for the temperature to climb ever slowly above 8ºC (this is the minimum temperature at which the tanking can be applied in order for it to cure) I got on with the job of fitting the retaining-wall-to-container flashing. Very tidy, even if I do say so myself :) Much, much more sensible than trying to mortar in small pieces of rock, and much easier to waterproof. This has a big fat bead of liquid nails behind each end which will in and of itself seal the joint, but I will make sure all the gaps are well and truly covered with the tanking membrane as well. With that done, there’s really very little else I can procrastinate with before I have to squeeze in behind the retaining wall and finish this effing tanking layer… Oh well, sooner I get started, sooner it’s finished.